Ethiopia's largest opposition party has announced it has formed an alliance with four rebel groups. The new Alliance Freedom and Democracy (AFD) says it will focus on peaceful struggle against the government but the armed groups will still stage attacks. Several leaders of the Coalition for Unity and Democracy (CUD) are on trial for treason following protests over last year's disputed elections. The CUD says the polls were rigged - charges rejected by the government. The AFD is calling for an all-inclusive conference to hammer out Ethiopia's political problems. "That is the only way to end the underlying causes of repression, bloodshed, insecurity, political instability and exclusion in Ethiopia," a statement said. A second opposition group, the United Ethiopian Democratic Forces, said it supported the Alliance but would not join in until member groups had been consulted. BBC Africa analyst Martin Paut says this is the first time that such a comprehensive opposition alliance has come together since Prime Minister Meles Zenawi came to power in 1991. AFD spokesman Hassan Hussein told the BBC the Alliance would like the conference to take place inside Ethiopia, and invited the governing party to join. But he recognised this was unlikely to take place. Instead, the AFD is calling on Ethiopians to use peaceful resistance against Mr Meles's administration. The Alliance includes the rebel OLF and ONLF groups, which are campaigning for greater rights for Ethiopia's Oromo and Somali communities respectively. The CUD says it is being persecuted by the government and human rights groups have expressed concerns about the fairness of the charges against several of its leaders, and the trial. The charges include attempted genocide. Amnesty International said the genocide charges were "absurd". They relate to alleged attacks on ethnic Tigrayans during last year's protests over disputed elections. 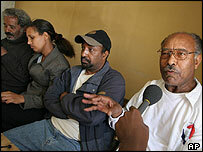 The trial was a test of the independence of Ethiopia's judges, Amnesty added. But chief prosecutor Shimeles Kemal said he would produce evidence to show the "defendants had the same criminal objective: to overthrow and dismantle the duly established government through violence." Mr Meles, a Tigrayan, has denied charges of election fraud and blames the opposition for starting the violent protests, in which at least 80 people died. 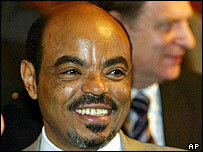 His government also points out it introduced multi-party elections to Ethiopia after years of military rule. He had been seen as a new type of African leader but donors have cut off some aid after the security forces used live bullets to end the protests. In the elections, the opposition made huge gains but say they were cheated out of victory. This entry was posted on May 22nd, 2006 at 13:18 by apache and is filed under Ethiopia.